Mexico is an extremely diverse country, both biologically (it's considered megadiverse, and is among the top five countries in the world in terms of biodiversity) and culturally. Spanish is Mexico's official language, and just over 60% of the population is mestizo, that is, a mix of indigenous and European heritage. But indigenous groups make up a significant part of the population, and many of those groups still conserve their traditions and speak their language. The Mexican government recognizes 68 indigenous languages that are still spoken today though considering the variants of those languages, which in some cases may be considered distinct languages themselves, we could count hundreds. These languages spring from about 11 different language families. Sadly, many of them have few speakers or speakers who are of advanced age, so they are in danger of disappearing in the coming years. Along with the language, many aspects of the culture will also be lost. The following table shows the indigenous languages spoken in Mexico with the name of the language as it is called by speakers of that language appearing in parenthesis and the number of speakers. The indigenous language that's spoken by the largest group of people by far is Náhuatl, with over two and a half million speakers. Náhuatl is the language spoken by the Mexica (pronounced meh-shee-ka) people, who are also sometimes referred to as Aztecs, who live mainly in the central part of Mexico. The second-most-spoken indigenous language is Maya, with about one and a half million speakers. The Maya live in Chiapas and the Yucatan Peninsula. 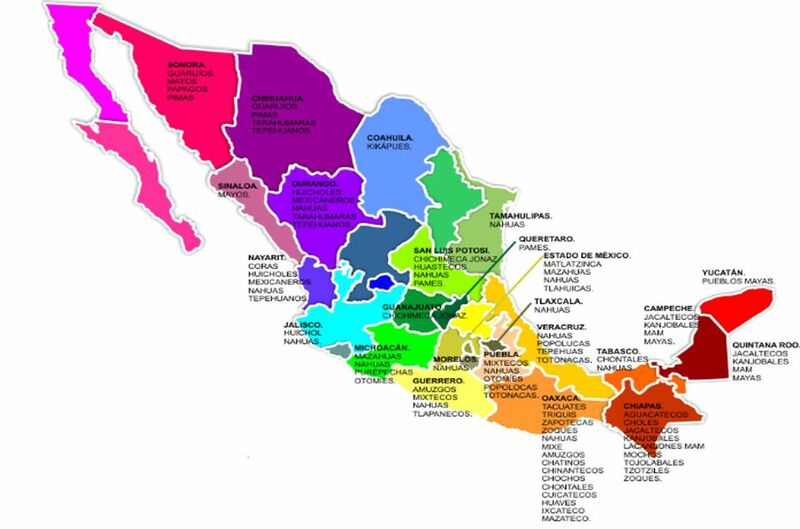 The third most spoken indigenous language in Mexico is Zapotec, with over 700 thousand speakers. The Zapotec live mainly in the southern state of Oaxaca. When we speak of mother tongues we are referring to all the languages of the world, since it is with this term that we identify the language we acquired at home, through our parents and other family members. The General Conference of UNESCO approved the initiative to celebrate the International Mother Language Day on February 21, and it was proclaimed by the General Assembly in 2002. Due to the risk to minority languages, the cultural and intellectual heritage of peoples, UNESCO has given priority to promote and strengthen cultural and linguistic diversity for the formation of sustainable societies, preserving cultural differences and languages in favor of tolerance and the respect. In January 2006, UNESCO appointed a strategic monitoring body (the special team on languages and multilingualism) and an operational surveillance structure (the network of language coordination centers) to promote efforts in all countries. related sectors and services that promote the use of languages in multilingual environments. As of February 2008, this Organization works at an international level to, among other tasks, develop coherent linguistic policies at a national and regional level, in accordance with its medium-term strategy. An International Day is an international recognition that sensitizes and draws attention to an important and pending issue in societies, so that governments and States act, taking relevant measures and fo course for citizens to demand their attention. In short, the United Nations takes the opportunity to show a way to the States by promoting actions that they can adopt in the search for solutions. February 21 is a commemoration that adds to the initiatives to strengthen the identities based on the use of the mother tongue and therefore of the linguistic rights.